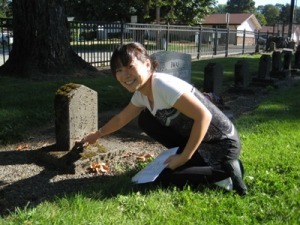 When Yoshiko Kato visited the cemetery to translate the kanji stones, I was particularly excited when she reached the fourth marker in the first row. Although the family surnames had been previously translated from most of the stones, this particular stone was marked on our transcript with only a mysterious, black question mark. We had, at that time, not even the least idea who might be buried in that grave. Yoshiko kneeled in front of the marker, leaning forward and backward alternately in order to make sense of the nearly illegible marks. She resorted to using a finger to attempt to trace the kanji, gleaning by feel information that proved to be too faint to read by eye. At this fourth stone she almost immediately announced that “Sato” was the family name, but the given name seemed to puzzle her. She was expecting a traditional Japanese name, but after studying the writing for some time, she reached a different conclusion. “Teddy,” she said, rocking back on her heels. “You know, like a teddy bear? It says Teddy. Teddy Goro.” The image that “Teddy” brought to mind was that of a child, perhaps even a baby, who tragically passed away early in life (as was too often the case for the children of Auburn’s Japanese families). 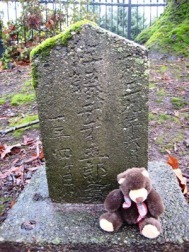 A few steps away from Teddy Goro’s grave was another Sato marker. 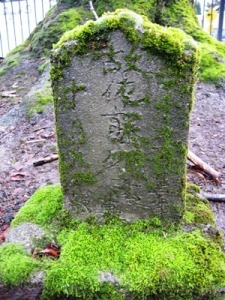 From this gravestone Yoshiko was able to read “Junko” as the given name and October 9, 1931 as the date of death. Were Junko Sato and Teddy Goro Sato related? On that sunny afternoon when Yoshiko visited the cemetery, there was no way to know. Subsequent research eventually answered our questions about the Sato Family. We discovered that Komakichi Sato arrived in the United States in about 1907. He first settled in Tacoma and established himself there as a businessman—he operated a laundry in the city’s downtown district. His early days were otherwise shrouded in mystery. There is some indication that he may have had a family when he lived in Japan, and that some of his relatives may have come with him to the United States. He was perhaps even widowed by the time he came to Tacoma. Nevertheless, we do know that he married Sayo Nikaido sometime around 1921. Their first child together was a son named Buell Kazuro Sato. Just over a year after Buell’s birth, Sayo gave birth to a second son, Crayton Akira Sato. Sometime after Crayton’s birth, Komakichi turned the laundry business over to a young relative, Tatsuo Sato. Komakichi and Sayo then moved on, eventually landing in Auburn, Washington, where the family made their living as farmers. They can be found there in the 1930 Federal Census with their older boys and two younger children, daughter Lena and son Yoshi. Sayo must have been pregnant at the time the census-taker visited the family. She gave birth to a daughter, Junko, on June 4, 1930. As we learned at the cemetery, Junko passed away on October 9, 1931. She would have been a 16-month-old toddler. She was probably walking by that age and learning to talk too. She was certainly developing her own personality and learning, as toddlers do, to charm both beloved adults and total strangers. Her loss at such a young, enchanting age must have been a terrible blow to the family. Unfortunately, losing children early in life wasn’t unusual in those years, and, regardless of their pain, life went on for the surviving family. Two years later Sayo gave birth to another son, James. Daughters Reiko and Mitsuko followed in 1935 and 1936 respectively. Finally, on March 20, 1938 Sayo gave birth to her last child: a little boy named Teddy Goro. This little brother was, tragically, almost exactly the same magic age as Junko had been when he too died and was buried in the Auburn Pioneer Cemetery. Like all of Auburn’s Japanese, the surviving Sato Family was sent to internment camps in 1942 after the United States entered World War II just a few months earlier. The Satos were sent first to California’s Pinedale Assembly Center before being sent on to Tule Lake. After the war, the family did not return to Washington; perhaps they didn’t have the means to re-establish themselves here. Instead they put down roots in Hayward, California. They were there in the 1950’s when, after more than 40 years in their adopted country, Komakichi and Sayo Sato were finally able to petition for U.S. citizenship. Komakichi, regrettably, lived only a few years after this momentous event. He died in California in 1958; Sayo passed away there in 1974. Both are buried in Mt. Eden Cemetery in Hayward, California. Although Junko and Teddy Goro’s family is no longer in Washington, it’s comforting to know that their family, including some of their siblings and many nieces and nephews, continues to live and thrive even today. Junko and Teddy undoubtedly hold special places in their memories. Thanks to Yoshiko’s efforts, they can now hold similar places in ours.